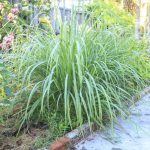 Three weeks back I brought a full grown lemongrass plant from the nursery and planted in a decent size container but the lemongrass plant is not producing any new leaves and existing leaves are becoming brown. It is rainy season now in India. Please help me to save my plant.